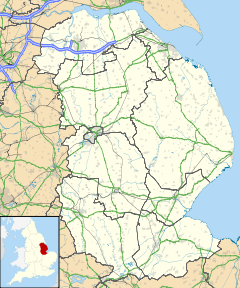 Carlton-le-Moorland, is a small village and civil parish in the North Kesteven district of Lincolnshire, England. It is situated between the town of Newark on Trent and the city and county town of Lincoln. The population of the civil parish at the 2011 census was 565. The nearest adjacent villages are Norton Disney, Brant Broughton and Bassingham. Carlton-le-Moorland is listed in the Domesday Book as consisting of 29 households, 255 acres (1.0 km2) of meadow, and a church. The parish church is a Grade I listed building dedicated to Saint Mary and dating from the 11th century, although the nave and tower were rebuilt in the late 16th century. The church was restored 1890-91 by C. Hodgson Fowler, and the font is 12th-century. Outside, the lychgate is Grade II listed, and was erected in 1918 as a war memorial. St Lazarus Hospital, a leper hospital founded prior to 1180, was sited in Carlton le Moorland, and maintained by the Order of Saint Lazarus. It is not known when it closed. According to England and the Crusades, 1095-1588 Nigel of Amundeville gave land at Carlton le Moorland to the brethren of the Order of Burton Lazars around 1242, probably because some of his family were sufferers of the disease. His father, Ralf, had given land in 1180 for the same purpose, as did his brother Elias, whose own daughter was a sufferer. The Knights Templar and a monastic order owned lands in and around the parish in the Middle Ages. Eventually the Disney family who had their main branch of the family in Norton Disney took ownership of estates with the ending of the monastic holdings locally in the 16th century. There are Disney family members buried in the church. There also used to be a manor house opposite the church, which was at one time lived in by the Disney family before they moved to Sommerton Castle. Carlton-le-Moorland has a post office, village hall, and public house called the White Hart. The parish council owns the village hall, the playing fields, and 'The Sands', an area of amenity land and allotments. Over the last twenty years the village has undergone development with more houses being built. ^ "Civil parish population 2011". Neighbourhood Statistics. Office for National Statistics. Retrieved 25 April 2016. ^ Carlton le Moorland in the Domesday Book. Retrieved 7 August 2011. ^ Historic England. "St Marys, Carlton le Moorland (1360553)". National Heritage List for England. Retrieved 7 August 2011. ^ Historic England. "Details from listed building database (1168108)". National Heritage List for England. Retrieved 7 August 2011. ^ Historic England. "St Lazarus Hospital (326121)". PastScape. Retrieved 7 August 2011. ^ Tyerman, Christopher (1996). England and the Crusades, 1095-1588. University of Chicago Press. pp. 205–206. ISBN 978-0-226-82013-2. Retrieved 7 August 2011. This page was last edited on 8 November 2018, at 12:04 (UTC).